Democracy is one of the great triumphs of civilisation. But the way democracy is practised, in the UK and in the wider world, leaves a great deal of room for improvement. In short, recent events show the risks of populism, which is a perversion of democracy. Can we improve democracy, so that it avoids the siren allure of populism? Can we take steps so that the best insights of the entire population rise to the top of political discussion, rather than being buried in a sea of confusion, rumour, innuendo, and downright lie? In an age with increasingly rapid communications, and with growing alienation of large parts of society, these questions are pressing. This article is the first in an envisaged Transpolitica series, “Anticipating better democracy”, that tries to catalyse some answers. Democracy is a system where the majority decides. It’s where leaders need the approval of the citizenry. But it’s not mob rule. Democracy allows the majority to appoint leaders. But it does not permit the majority to ride roughshod over the opinions of the minority. It avoids placing absolute power into the hands of the winning coalition. The minority have important rights too. Democracy enables political disagreements to be handled by discussion rather than by physical force. It avoids the powerful retaining power simply via their ability to summon armies and command the police. It allows the citizenry to vote leaders out of office, once these leaders no longer have sufficient popular support. Democracy therefore addresses the dangerous human trait in which people who have risen to a position of power tend to become overly confident in their own abilities, surround themselves by yes men, veer towards autocracy, and brook no dissent. Done right, democracy allows the opposition to speak truth to power. To be clear, democracy is more than the simple fact of an election. Democracy is about the climate that prevails, both in the run-up to an election, and in its aftermath. To avoid a region descending into chaos after an election takes place, democracy requires the loser of an election to swallow hard, congratulate the victor, and to stop contesting the result. My friends, we have come to the end of a long journey. The American people have spoken, and they have spoken clearly. A little while ago, I had the honor of calling Sen. Barack Obama — to congratulate him on being elected the next president of the country that we both love. Sen. Obama has achieved a great thing for himself and for his country. I applaud him for it, and offer my sincere sympathy that his beloved grandmother did not live to see this day — though our faith assures us she is at rest in the presence of her Creator and so very proud of the good man she helped raise. Sen. Obama and I have had and argued our differences, and he has prevailed. No doubt many of those differences remain. These are difficult times for our country, and I pledge to him tonight to do all in my power to help him lead us through the many challenges we face. Tonight — tonight, more than any night, I hold in my heart nothing but love for this country and for all its citizens, whether they supported me or Sen. Obama. I wish Godspeed to the man who was my former opponent and will be my president. Nevertheless, whilst a democratic decision provides a milestone landmark, it’s not necessarily the end of the journey. The party that lost an election does not vanish into nonexistence. There is no iron law of democracy that says a losing party must give up its ideological understanding once the voters have spoken against it. Instead, it can regroup, and be ready to offer a renewed understanding to the electorate in the changed circumstances of the future. In some cases, it may not take long for circumstances to change. This is especially the case when a democratic decision has taken place in a particularly confusing environment, and where greater clarity emerges soon after the vote has taken place. In such a case, the voters may justifiably feel angry about being deceived by the way the campaign was conducted. In this article, I’ll avoid focusing too closely on the contentious circumstances of the recent EU exit vote in the United Kingdom. Opinions clearly differ, forcibly, on that score. I’ll just note in passing that even Kelvin Mackenzie, former long-time editor of the right-wing Sun tabloid newspaper, has expressed his own “buyer’s remorse” for voting for the UK to leave the EU (despite having previously campaigned hard for that outcome). But let’s concentrate, for now, on some steps that might be taken to improve the calibre of democratic decision-making – steps that might avoid future examples of widespread voter regret (and major voter distress). I’ll consider two suggestions. The Advertising Standards Authority has firm rules about the kinds of claims that companies can make in their advertisements. Thank goodness. While legal action can follow in the case of a commercial contract or the public flotation of a company if false statements are made in, there is no advertising code that requires political statements to be “legal, decent, honest and truthful”. It’s tempting to ask: Why not? If politicians knowingly bend the truth, in ways that wouldn’t be allowed in commercial communications, and major financial damage results, shouldn’t they be sued as a result? However, I see this as potentially dangerous ground. The threat of being sued could clamp down on free speech. To make this work, the emphasis would have to be on evidence that the politician definitely knew their claims were wrong, but went ahead with them regardless. Before we get to that point, we can accelerate an important recent political trend. That’s the trend of improved, quicker fact-checking. One of the most impressive organisations I’ve encountered recently is Full Fact – which describes itself as “the UK’s independent factchecking organisation”. We check claims made by politicians, the media, pressure groups, and other voices in public debate, and push for corrections where necessary. We also work with government departments and academic research institutions to improve the quality and communication of technical information at source, and campaign for greater transparency in the public arena. We don’t support any view or political party. Our mission is to improve the quality of public debate, and to equip the public with the best information possible to make up their own minds. We provide links to all our sources so that you don’t have to take our word for anything – you can also check for yourself. In other words, claims on both sides of the debate were found wanting. Full Fact have accomplished a great deal with only a skeleton team. But with more support (including volunteers, funding, and other resources) there’s much more that can be accomplished. Of course, much political debate happens in dimensions removed from facts. And facts are often capable of multiple interpretations. 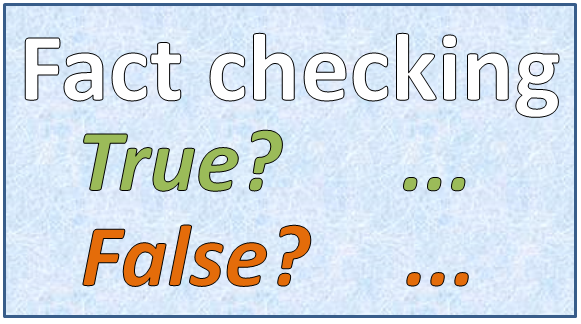 So fact-checking, by itself, won’t cure all the shortcomings of our present-day practice of democracy. Newspapers that make claims that violate independent fact-checking will, likewise, become pariahs. For 25 years our press has fed the British public a diet of distorted, mendacious and relentlessly hostile stories about the EU – and the journalist who set the tone was Boris Johnson. I know this because I was appointed Brussels correspondent of The Times in 1999, a few years after Johnson’s stint there for The Telegraph, and I had to live with the consequences. Johnson, sacked by The Times in 1988 for fabricating a quote, made his mark in Brussels not through fair and balanced reporting, but through extreme euro-scepticism. He seized every chance to mock or denigrate the EU, filing stories that were undoubtedly colourful but also grotesquely exaggerated or completely untrue. Will this cultural change be sufficient to fix the current ails of democracy? Of course not. But it’s an important step in the right direction. Transpolitica plans to publish more articles on anticipating better democracy. If you’d like to submit a contribution, please get in touch. This entry was posted in White paper and tagged Democracy, fact checking, Full Fact, populism, Transpolitica by David Wood. Bookmark the permalink.